Boy, it really is trying working with a crappy internet connection. It took me such a long time to upload my videos on YouTube but thankfully, it’s all completed now and I could proceed with blogging! I was in Kinta City (yes, AGAIN) on Sunday, 11th January, 2009, to shoot videos of this Chinese Orchestra performance which started at 8pm. The show lasted almost an hour but I left after 30 minutes. Why? It was not entertaining at all. Don’t get me wrong. It’s not that I do not know how to appreciate Chinese instrumental music. In fact, I do own a few CDs of music of this genre and enjoy them thoroughly. The thing is, I have watched this orchestra a few times already, all courtesy of Kinta City if memory serves me right and each time, these musicians have their eyes stuck to their music sheet. They have no expression, no smiles, no interaction with the audience. In short, there was no showmanship. Also, some of the pieces were solo or duets. The rest of the musicians sat at their places like dunggus or they whispered to each other. They should incorporate all the instruments in each piece or to arrange their pieces in such a way as to end with a duet, and then solo so that the rest of the musicians could retire backstage. Maybe my standard is too high but I believe that if you are going to perform to the public and being paid for it, you MUST have at least a certain “standard”, right? Forgive me if I am too harsh but of the times that I have watched this orchestra, I see no improvement at all. And you know what? I just went through the Kinta City Chinese New Year 2009 program again and realized that they have planned shows which are exactly the same as last Chinese New Year. I may be wrong and will only know after I have watched them all but I noticed their Chinese Drum Performance and Happy Prosperity CNY Dance. I am looking forward to video the Chinese Drum Performance, though. I love it and have watched it a few times but never shot a video of it before. Hopefully, I would be able to make my way to Kinta City this Friday, 16th January, 2009. 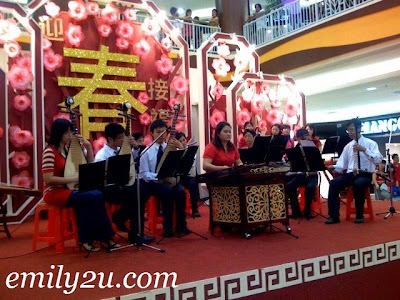 One Response for "[Video] Chinese Orchestra Performance @ Kinta City"
i really like listening to the chinese orchestra. not because the music is good but to know that there r young people still learning these traditional music instruments. wow. u and this guy got fate to meet!